In light of his commutation of what he called the "excessive sentence" of I. Lewis Libby today, President Bush has agreed to review all sentences in the United States because "that would only be fair." "Judges and panels of judges routinely review excessive sentence claims throughout the land," said Bush, " but the Libby case has made me see that our exhaustive system of appellate review is flawed." The judge in the Libby case followed strict federal guidelines written by Congress and the U.S. Sentencing Commission, which labored for years to write an exacting code that was designed to ensure that all felons were treated equally. "What the guidelines do not take into account," said Bush, "is that some felons are more equal than others." "These so-called 'guidelines' do not give adequate guidance to judges in certain cases," Bush said. His voice quavered as he added, "Some people -- for instance, rich and the powerful Republicans who, through no mistake of their own, are accidentally caught breaking the law -- sometimes do not receive proper treatment." Bush was then too overcome by emotion to continue with his statement. He retired to his residence on Kennebunkport to swill beer with President Putin, who agreed with the President's actions. "In my country when pipples lied to the State, we tortured them," the former head of the KGB said, "except when they were fellow KGB. Then we clapped them on the back and danced with vodka bottles on our heads." Other felons praised the President's decision. George Finnerty, a real estate maven doing six years for lying the I.R.S. about his income, said that Bush had "given all liars real hope." Douglas W. Cox, who got ten months for testifying falsely about the ownership of five vending machines [pdf], prayed for Bush's forgiveness but was pessimistic. "I didn't come close to obstructing a Federal investigation of crime at the very highest levels of government," said Cox, shaking his head. "I don't think I qualify for the Libby treatment." 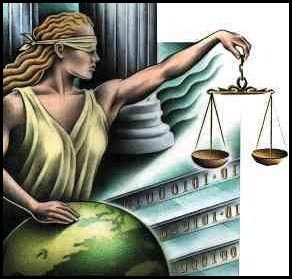 For her part, Lady Justice was happy to hear about President Bush's actions. "I'm so glad I'm not completely blind," she said.